Since the launch of the iPad, colledge educators have been seeking an inexpensive alternative to paper textbooks that could leverage the collective knowledge of teachers and students. With a $249,000 grant from the Gates Foundation’s Next Generation Learning Challenge, Dr. Daniel Johnson of Wake Forest University and education technology firm Odigia might have found it. Their BioBook, an iPad and web-enabled interactive biology textbook, creates a fully customizable experience for both students and educators. 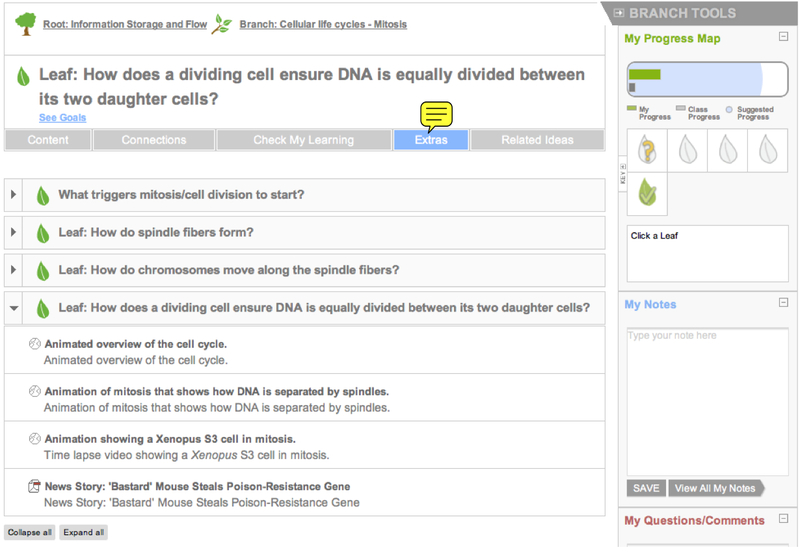 For educators, the BioBook allows professors to track individual student progress and develop their own textbooks from a national database of professor-generated, mix-and-match chapters. On the student side, linear chapters are remixed into “branches and leaves,” where students explore concepts as interlinked ideas, moving from fundamental facts to an array of detailed chapters, which students can explore in their own way. Instead of reading like storybook, chapters are reformed into a branch/leaf relationship; all students start with the same fundamentals and explore details as their curiosity guides them. “Each newly acquired piece of knowledge in turn raises additional questions that encourage exploration of other previously unknown concepts, theories, or facts.” writes Dr. Johnson. Put another way, expert learners construct their understanding by following what seems to be a logical path to them, not a pre-defined path.” In other words, traditional textbooks assume that students all the learn the same way, but the BioBook allows students to seek different learning paths as they encounter questions and points of curiosity. Along the way, students are given self-assessment quizzes and pose questions to the class, with comment boxes and annotations appearing next to the text for a more social experience. Eventually, BioBook plans to allow university partners throughout the world to create their own chapters and upload them into a national database that can be mixed and matched into a customized textbook, built on top of the widely used open-source education platform, Moodle. Dr. Johnson and his team will curate and produce an official BioBook, using contributions from the academic community to revise and update chapters. “We expect parallel review and analytics data will drive most of the routine correction, revision, and page adoption decisions,” he says. Since the BioBook collects data from students on the fly, knowing what students like–and don’t like–should automatically inform the decision-making process on which chapters ultimately end up in the official book. “Data analytics will be collected on standard and alternative versions that let us determine if students (or specific subgroups) learn better from a particular version,” Dr. Johnson continues. “If an alternative version proves more effective over time, we will ask the originating author for permission to make their page our new “standard” version; the prior version will be retained as an alternative as long as other instructors continue using it.” Professors are then free to swap out official chapters for alternative versions, or create their own. All professors retain some intellectual property rights under a Creative Commons License but are encouraged to contribute their ideas to the community–a community that could give standard textbooks a run for their money. Follow Greg Ferenstein on Twitter, Google+, or Facebook. Also, follow Fast Company on Twitter.